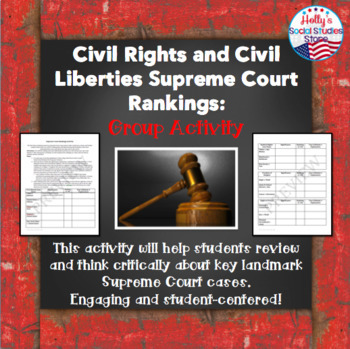 This group activity is designed to help students review and evaluate landmark Supreme Court precedents in the areas of civil liberties and civil rights. 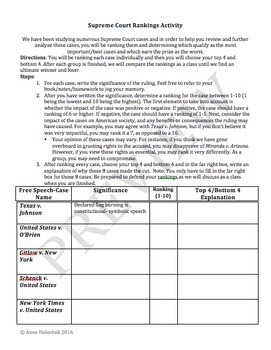 Students will participate in a rankings activity that will require them to critically think about important Supreme Court precedents, will prompt meaningful discussions, and will help students review the material. There are both small group and whole class elements included in this lesson and the material is applicable to both regular government and AP® Government students. Due to the product's format, I have uploaded both a PDF and word document in order to make it user-friendly. The word doc of course is editable, but if you are having trouble with its formatting, the PDF is available to you as well. 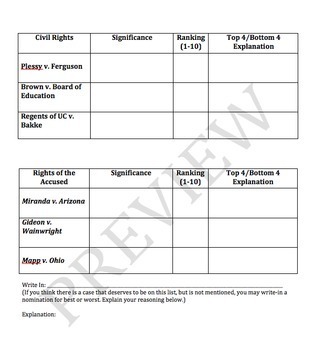 I have also included a teacher instructions page to help you implement the activity in your classroom, as well as a quick reference guide for teachers that provides the significance of each case. They are all included in a zip file. This product is also available in my Civil Liberties and Civil Rights Unit BUNDLE for AP® U.S. Government at 20% off.